OilMedica – Polish Equivalent of Vatika Coconut Oil – Natural coconut oils for hair! 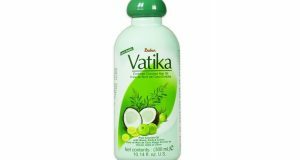 Vatika is well known for its properties, hair conditioner. Danbur Indian brand in its recipe reaches to Ayurvenda’s beauty secret, which is undoubtedly coconut oil. Today we would like to introduce to you Polish product from OilMedica, i.e. hair mask and conditioner with coconut oil, which has a chance to become an equivalent to Indian mix of oils for hair. Coconut oil, i.e. one of the best vegetable oils for hair. 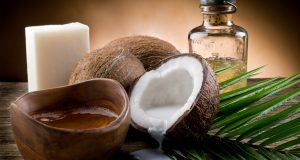 Price of coconut oil is really affordable, and the oil is very efficient, and its greatest quality is fact that it can penetrate hair structure and nourish hair from the inside out. 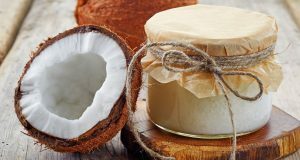 Because of its properties, coconut oil is best at hair conditioning of high porosity hair and is great base product for conditioners like OilMedica. Sunflower oil, i.e. wealth of polyunsaturated fats. Properties of such oil is simple – is anti-inflammatory and provides smoother. Castor oil, i.e. best oil for hair growth. It is quite heavy oil, that is why it is best as a part of a mix, just like OilMedica – it strengthens roots and stimulates them to work, which means hair growth and presence of baby hair. Amla extract – strengthens roots, accelerates growth and helps with dandruff. Oats extract – stimulates micro-circulation, regulates and soothes inflammations. Henna – it has antibacterial, strengthening and smoothing properties and makes hair thicker. Centella Asiatica extract – accelerates hair growth and strengthens roots. Rosemary extract – stimulates micro-circulation and provides nourishment to roots. Lemon grass oil – regulates production and secretion of sebum. Lemon oil – has antiseptic properties and provides fresh scent. 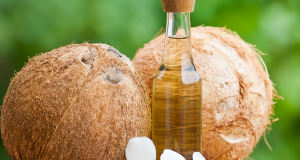 How does OilMedica coconut oil work? Hair mask and conditioner from OilMedica is a flagship product of this brand, which composition was developed to enhance properties of coconut oil and strengthen them with rest of vegetable extracts. OilMedica restores and regenerates streaks, makes hair soft and healthy, but also protects them against damages.